Orvill Culpepper, Daughter [sic], F, 11/12, S, TX TN TX. Hattie May Culpepper, Female, Single, died 27 Apr 1967 in Deaf Smith Co., TX. H D Culpepper, Male, died 15 Sep 1980 in Deaf Smith Co., TX. Verna Culpepper, Dau, F, 19, S, TX TX TN. Orville Henderson Culpepper, Male, died 16 May 1979 in Deaf Smith Co., TX. Orvilene Elizabeth Culpepper, Female, born __ 1935 in Dallas Co., Texas, child of O H Culpepper and Frances Nell Kester. Frankie Lee Culpepper, born __ 1937 in Deaf Smith Co., TX, daughter of O H Culpepper and Frances Nell Kester. James Henderson Culpepper, born __ 1938 in Deaf Smith Co., TX, son of Orville Henderson Culpepper and Francis Nell Kester. Hallie Mae Culpepper, born __ 1943 in Deaf Smith Co., TX, daughter of Orville Henderson Culpepper and Francis Nell Kester. Biography* � John Asbury Culpepper and his wife, Fairy, had twelve children, eight of whom each celebrated their Golden Anniversaries, two others were each married for 49 years, and one was married for 36 years. The longest marriage was 67 yeats, and the average of the 11 marriages is 56 years. Their only other child died unmarried in an accident in her youth. None of their children divorced, and all the marriages eventually ended in death. They also have two grandchildren who have celebrated their Golden Anniversaries. Collectively, these 13 couples have been married for over 725 years! Sadly, John and Fairy's own marriage ended with the early death of John after only 24 years. Their amazingly committed and long-lived group of descendants are listed below with the longest marriages first. Fay 'Zoe' Culpepper and Rev. Joseph Troy Emanuel married 6 Jan 1934, and at the time of Joe's death in Dec 2000, they had been married 66 years. 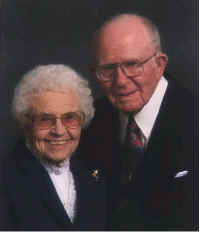 Rayford Culpepper and Alma Capps were married 15 May 1939 and at the time of Rayford's death in Mar 2005, they had been married 65 years. Wayne Culpepper and Freddie Keihling married Jun 1933 and at the time of Freddie's death in Jul 1996, they had been married 63 years. Travis Culpepper and Marjorie Naylor married 2 Jul 1943 and at the time of Marjorie's death on 30 May 2002, they had been married 58 years. Edna Culpepper and Elmer McGuffin married 8 Jun 1940, and at the time of Elmer's death in Dec 1996, they had been married 56 years. Noel Culpepper and Nita Coker married 28 Aug 1941, and at the time of Nita's death in Oct 1997, they had been married 56 years. Alvin Culpepper and Ruth Fryar married 17 Sep 1927, and at the time of Alvin's death on 17 Nov 1982, they had been married 55 years. Curtis Culpepper and Althea Lowe married 21 Jul 1935, and at the time of Curtis's death on 21 Dec 1984 they had been married 49 years. Ola Culpepper and John Hacker were married 7 Aug 1928, and at the time of John's death in Mar 1977, they had been married 49 years. Clara Culpepper and Dallas Clark were married 19 Mar 1932, and at the time of Dallas' death in Oct 1968, they had been married 36 years. Cletis Culpepper, born 3 Feb 1915, died unmarried at the age of 16 in a school bus accident. She is the only sibling to have not had a marriage of at least 36 years! Helen Culpepper and Jack Jennings (both still living) were married on 16 Jul 1950 and as of 16 Jul 2009 had been married 59 years. Fairy Culpepper, Wife, F, 25, M1, ch 4/4, TX KY MO or MS? Curtis Culpepper, Son, M, 5/12, S, TX TX TX. Grantee: Jno. A. Culpepper; Patentee: J. D. Huggins; 19 Jun 1917; 320 acres; Briscoe Co., TX. Edna Culpepper, Dau, F, 1 10/12, TX/TX/TX. Obituary of Rayford "Ray" Culpepper published 4 Mar 2005. Noel Culpepper, Rayford Culpepper, Travis Culpepper. Obituary of Clara Culpepper (Clark) Johnston, published 21 Apr 2007. Travis Culpepper, Son, M, 3 10/12, TX/TX/TX. Ola Culpepper and W. J. Hacker, 7 Aug 1928. Photographed* Jan 1984� She was photographed in Jan 1984 at age 75. Culpepper. She graduated from Grady High School and Weatherford (TX), junior college. After part of a year teaching school, on January 6, 1934, she married Joseph Troy Emanuel, an ordained Methodist minister. Fay (Zoe to her friends) and Joe have one son, Joseph Troy, Jr., who is married and is a college professor at Bradley University in Peoria, IL. Joe and Fay have served (United) Methodist churches in Roy, NM, Gardner, CO, Kermit, TX, Lordsburg, NM, El Paso, TX, Monahas, TX, Las Cruces,NM, Carldbad, NM, Albuquerque, NM, Artesia, NM, Lovington, NM, Gallup, NM, and Alamogordo, NM. Joe and Fay recently moved to Manorcare at Riverview in Peoria, IL. Annabel Margaret Downing Buie was the daughter of Daniel Buie (b) ca 1770, Cumberland Co, NC, (d) 1823 Robeson Co, NC. and Flora McPherson (b)1775, Cumberland CO, NC. Flora was the daughter of Daniel McPherson and Sarah McNeill, she died on 11-10-1859 in Robeson Co, NC. The father of Annabel was Daniel Buie, the son of Malcolm Buie (b) ca. 1735, on the Isle of Jura, Scotland. He died 2-1781, Richland Swamp, Bladen Co., (now Robeson Co). He married Ann McCraine (b) ca. 1745, Bladen Co, (now Harnett Co) and (d)11-22-1822 in Robeson Co, NC (she was the daughter of Hugh Mccraine and Catherine Buie). Malcolm and Ann married about 1760. E-mail written 1998-2006 to Lew Griffin & Warren Culpepper from Nancy McNeil Brandon, e-mail address. Sarah Culpepper and J. S. McNeil on 30 Aug 1883 in Thomas Co., GA.
5 Jan 1905, page 6, Wedding Annoucement of Miss Mararet Allean Mathis and Mr. Albert B. Culpepper, 4 Jan 1905, Augusta, Richmond Co., GA.
Will Lane, Boarder, M, 22, S, GA/GA/GA. Mamie Lelimer, Servant, F, 20, S, GA/GA/GA. 20 Jun 1929, Wedding Annoucement of Miss Meryl Culpepper (d/o M/M A. B. Culpepper of Augusta, GA) and Dr. J. Randolph Gepfert, Jr. married 19 Jun 1929 in Augusta, Richmond Co., GA. The Palm Beach Post, obituary of John R. Gepfert III, published Jan 1 - 2, 2015. 5 Jun 1931, page 9A, Wedding Annoucement: Miss Margaret Culpepper (d/o M/M A. B. Culpepper of Augusta, GA) and Mr. John T. Chesser (s/o M/M William M. Chesser of Augusta) married 4 Jun 1931 in Augusta, Richmond Co., GA.
John T. Chesser, died 13 Jan 1986 at 81 years in Richmond Co., GA. Residence in Richmond Co., GA.
Margaret A Chesser, died 26 Mar 1994 at 85 years in Richmond Co., GA. Residence in Richmond Co., GA.
Charlie C. Culpepper, d. 22 Nov 1924 in Lanier Co., GA, 33742-F.
Obby Bay Culpepper, Son, M, May 1899, 1, Sng, GA/GA/GA. Charles Culpepper, 8, M, GA.
Charles Culpepper, Nephew, M, S, W, 19, --- , GA/GA/GA. Charlie Culpepper and Annie Harell on 27 May 1883 in Worth Co., GA.
+ Willie Crosby Culpepper, 5 Dec 1906 - 13 Jan 1982. Ipo Culpepper, d. 6 Aug 1992 at 90 years in Lowndes Co., GA; Res. in Lowndes Co., GA, # 030285. Ipo Culpepper, Son, M, 8, Sng, GA/GA/GA. Ada Culpepper, Dau-in-Law, 14, md, GA/GA/GA. Maudie Culpepper, Wife, F, 17, md1-3/12 yr, ch 7/6, GA/GA/GA. Max L. Tatum, compiler, Marriage Records of Eight Georgia Counties (2 vols. ), Albany, GA: Max L. Tatum, 1990 Repository: LDS Family History Library - Salt Lake City, Call # 975.8 V2t.Effie Culpepper and Alonzo Walker on 6 Oct 1907 in Worth Co., GA, Book 5-1.
death certificate of son Curtis S. Culpepper has name as "David S."
William Culpepper and Bessie Mae Hill on 7 Dec 1917 in Worth Co., GA, Book 6-303. Obbie Culpepper and Ada Youngblood on 12 Aug 1918 in Worth Co., GA, Book 6-328. Obituary of Donald O. "Buck" Culpepper (#60774), published 13 Nov 2009. Obbie B. Culpepper, d. 3 Nov 1972 at 73 years in Lowndes Co., GA; Res. in Lowndes Co., GA, # 034210. + Elvie E. Culpepper, 11 Jan 1866 - 1 Oct 1939. Mary L. Culpepper, Daughter, F, Feb 1900, 3/12, Sng, GA/GA/GA. Elie Cox, Father, M, 77, wd, GA/GA/GA, CSA Vet. Mary L. Culpepper, Dau, F, 19, S, GA/GA/GA, School Teacher. Obituary for Marilizzie Culpepper Stevens, 26 Oct 1997. E-mail written 2002 to Lew Griffin from Thomas M. Crews III. Biography* � That Mury's husband was a Green, is known from her father's will. That his first name was Henry is speculative. It could have been Thomas. Henry Green witnessed the will of Mury's father, Robert Culpepper. And Henry and Robert Green, and their father Robert Green, lived near the Culpeppers. my Said ffather in Law Sole Executor. witnesses: John Johnson, his marke. of one hundred Acres and twenty five of Land I bought of Marmaduke . to my Daughter Sarah Brown at the death of her husband John Brown . the plantation and Land I bought of Marmaduke Etheredge Junr being . Will Book p. 13, etc. Proved 18 July 1723, by Eliza Collins. Alice A. Tart & Seal.